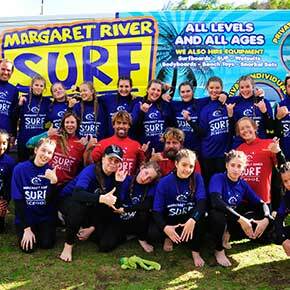 The Margaret River Surf School has a wide range of surf equipment to hire or buy. Check out our Surfboard Hire & Equipment Price List below to see our wide range of surf essentials. We understand how important it is to get out in the surf whenever possible and sometimes when you are travelling you can’t bring all your surf gear with you! That’s why the Margaret River Surf School is available for surf hire even outside shop hours with the latest gear and widest range to choose from. We hire children’s, women’s and men’s wetsuits of all sizes and styles, soft and hard surfboards to suit all abilities as well as Stand-up Paddle boards, bodyboards, skimboards, snorkel sets, beach toys and beach shelters. Check out our Surf Hire Price List. We hire surf equipment from our mobile surf van and home so please call us on 0401 616 200 to find out our location and arrange pick up. Be sure to ask us about our great discount options for hiring longer than 24 hours!